The Utes will remain in fourth place this week, until playing Saturday at Colorado. Pullman, Wash. • The only two Pac-12 basketball teams that beat Washington State in the past three weeks held the offense-oriented Cougars to 36 second-half points. First-place Washington, not surprisingly, was one of those clubs. The other? Utah, the team that hardly appeared to be in the Huskies' league as of Wednesday in Seattle. Utah recovered offensively in Saturday’s 92-79 victory at Washington State. The Utes won the game because they improved defensively after a poor start at Beasley Coliseum, where Washington had won by only two points the previous weekend. The shooting of Sedrick Barefield and Parker Van Dyke got Utah going in the first half, and the stopping power of Donnie Tillman and his teammates kept them ahead in the second half. This game unfolded a lot like Utah’s Pac-12 opener at Arizona State in early January, when the Utes looked lost and disinterested before suddenly coming together. Utah beat WSU for the 11th-straight time. “I haven’t told our guys all year the magnitude of a game like this,” coach Larry Krystkowiak said. “Obviously, there was an added impetus and importance to this game to stay in contention for a bye in the first round” of the Pac-12 tournament. The message kicked in, eventually. The Utes' 10-0 run gave them a 36-31 lead late in the first half and they stayed in front. Utah (15-12, 9-6 Pac-12) will spend the week alone in fourth place in the Pac-12, before playing Saturday at Colorado. After that, they'll finish the regular season at home against USC and UCLA, hoping to stay in the top four and give Krystkowiak the tournament seeding he's continually targeting. Two more wins likely would do it. One variable is that Utah owns tiebreakers over USC and UCLA, although that could change with a loss to the wrong Los Angeles team. • Tillman’s emergence vs. WSU was encouraging, in multiple ways. The sophomore forward posted 16 points, 11 rebounds, four assists and two blocked shots in a performance that reminded everyone why he’s so important to Utah, now and in the future. He guarded WSU star Robert Franks intensely, battled for rebounds and looked like the all-around player he’s supposed to be. “When he comes with that mentality, he’s an amazing two-way player,” Barefield said. • Some labels are worse than “inconsistent.” The Utes have looked bad at times in the conference schedule, but they’ve never absorbed more than two losses in a row. Wins at USC and Washington State have kept their season going. 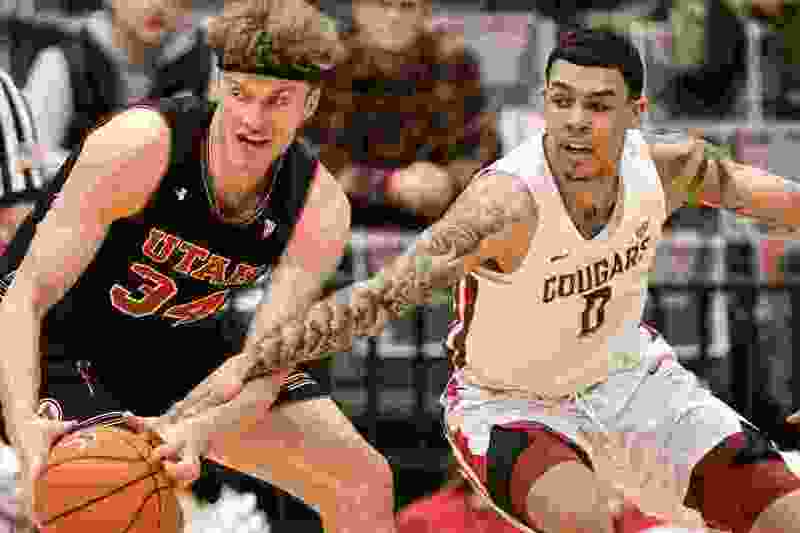 • Utah’s top-four seed in the Pac-12 tournament matters only if the Utes do something with it, after losing in the quarterfinals the past two years in Las Vegas. They would have to beat Washington at some point, likely in the semifinals, and the Huskies have dominated them twice. Regardless, an 11-7 conference record would be notable for this team, even in the Pac-12′s current landscape. Barefield. After going scoreless in the game’s last 33 minutes at Washington, the senior guard missed his first two shots Saturday, then made seven straight — including two 3-pointers. He finished with 33 points, matching his season high vs. Nevada in December. He played all 40 minutes vs. WSU and his ability to draw fouls and make free throws was critical. Charles Jones Jr.'s 3-pointer. The Utes went 16 of 35 from 3-point range Saturday, missing their last four attempts and falling one short of the school record for 3-pointers. Barefield and Van Dyke made five each, Tillman had four, and Riley Battin and Jones added one each. Jones’ shot from Jayce Johnson’s assist was as big as any of them, after WSU’s consecutive 3-pointers had cut Utah’s lead to eight midway through the second half. The former NJCAA Player of the Year hardly has thrived in Division I, averaging 3.8 points in Pac-12 play, but he came through after the Cougars were surging. Much like WSU, Colorado is better than the team that came to the Huntsman Center in January. The Buffaloes (16-11, 7-8) had won five-straight games before losing by two points in Pullman and by nine in Seattle.